Ash Wednesday is the first day of lent, and occurs 46 days before Easter. It is a “moveable” feast, falling on a different date each year, simply because it is dependent on the date of Easter Sunday. It can occur as early as February 4th or as late as March 10th. According to the Canonical Gospels of Matthew, Mark and Luke, Jesus spent forty days fasting in the desert before the beginning of his public ministry. During this time, He endured many temptations by Satan. Ash Wednesday marks the beginning of this 40-day Liturgical period of prayer and fasting. Ash Wednesday derives its name from the practice of placing ashes on the foreheads of the faithful as a sign of mourning and repentance to God. The ashes used are typically gathered after the palms from the previous year’s Palm Sunday and are burned. For Catholics, at Masses on this day, ashes are imposed on the foreheads of the faithful. The Priest or in some cases Layperson, marks the forehead of each person with black ashes in the sign of the cross, which the worshipper traditionally retains until it wears off. The act echoes the ancient tradition of throwing ashes over one’s head to signify repentance before God. The Priest says, “Remember that thou art dust, and to dust thou shalt return” – Genesis 3:19. 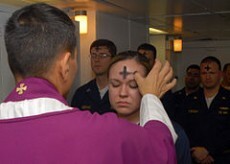 The Liturgical imposition of ashes on Ash Wednesday is a “Sacramental” not a “Sacrament”. The ashes are blessed according to liturgical tradition, for Catholics, involving the use of Holy Water or olive oil. . In the Catholic Church, ashes being a “Sacramental” may be given to ANYONE who wishes to receive them, as opposed to a Catholic “Sacrament” which is reserved for Church members, except in cases of grave necessity. In the Catholic Church, Ash Wednesday is observed by fasting, abstinence from meat, and repentance – a day of contemplating one’s transgressions. On Ash Wednesday and Good Friday, Catholics between the ages of 18 and 59 – providing their health enables them to do so, are permitted to consume only one full meal, which may be supplemented by two smaller meals, which together should not equal the full meal. Some Catholics will go beyond the minimum obligations demanded by the Church and undertake a complete fast of bread and water. Ash Wednesday and Good Friday are also days of Abstinence from meat, as are all Fridays during Lent.